Pre-wound embroidery bobbins represent the perfect combination of quality and time-saving convenience. Packaged to speed your production and precision-wound to guarantee the correct number of yards per bobbin. Pre-wound bobbins greatly reduce sewing interruptions and include your choice of magnetic, cardboard, plastic or sideless embroidery bobbins. There are two bobbin sizes, identified as Style L Standard or Style M Jumbo. 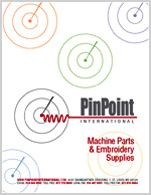 Style L is the most common size for commercial embroidery machines and holds between 116-135 yards of bobbin thread. Style M bobbins can hold up to 235 yards of thread. Most bobbins are sold by the box which contain 144 bobbins per box. Please take note of the packaging size when ordering.